This group was originally founded in 1959 and operated as the Magnetic Materials Producers Association (MMPA). In 2001, PMD became the International Magnetics Association (IMA) and IMA replaced MMPA, expanding its scope and operations in recognition of the global nature of the magnetic industry. In 2007, PMD became a part of SMMA, the motor and motion trade group. In 2015, SMMA merged with the Motion Control & Motor Association (MCMA). PMD is now an active part of MCMA, who supports the work of the PMD and the greater good it brings to the industry. Secretary: Mike Devine, Adams Magnetic Products Co. 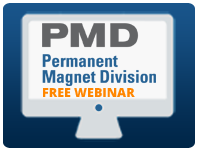 This webinar provides a brief review of magnetic theory and ferromagnetism and also covers the properties of permanent magnets while demystifying some of the terms and definitions commonly used to describe magnetic materials. Rare earth magnets are becoming increasingly popular for torque coupling and rotors to improve efficiencies, reduce weight and power consumption. The design of the product, proper magnet installation and manufacturing of the final assemblies offer a unique set of challenges. Dangers, safety considerations and best practices are often overlooked until an accident occurs. Click here to learn more. Magnet Producer — Manufacturers of one or more of the following products: bonded magnets; ceramic magnets; metal magnets; soft ferrites and soft metallic materials. Distributor/Fabricator — Distributors of magnetic materials and/or fabricators of products or components containing magnetic material. Supplier — Suppliers of materials and services to the permanent magnet industry. MCMA Members who fit the criteria and want to join PMD (no additional fee) should contact us at info@motioncontrolonline.org. Contact MCMA at + 1 734-994-6088 to learn more.